With 21 communities in eight states, Acts Retirement-Life Communities provides luxurious accommodations, a full complement of life-enriching activities and on-site assisted living, skilled nursing, and rehabilitative care to those looking for resort-like retirement living with a secure future. And when Acts wanted to revamp their website and digital marketing efforts amidst a corporate rebranding, they looked to Arc Intermedia for guidance. First step: Develop a responsive website that would provide users a consistent experience across computers, tablets, and phones. As customer acquisition specialists, our goal for this partnership with Acts is simple: Get more residents into their communities. Much of that comes from our ongoing marketing efforts post site-launch, which include SEO, SEM, display advertising, retargeting, etc. But for the website, it came down to this: Make it really easy for someone looking for a retirement community to discover why an Acts community is a great fit. Here’s how we went about achieving that. We also learned through our research that Acts’ audience wants a quick path to the content they’re after. As such, we placed four boxes at the bottom of the header image as a call-out specific to each type of user: Someone looking for his or herself, someone looking for a family member or loved one, someone looking on behalf of a client, or someone seeking general information. Each particular user finds the message intended for his or her specific needs and is that much closer to understanding the benefits of living at an Acts community. 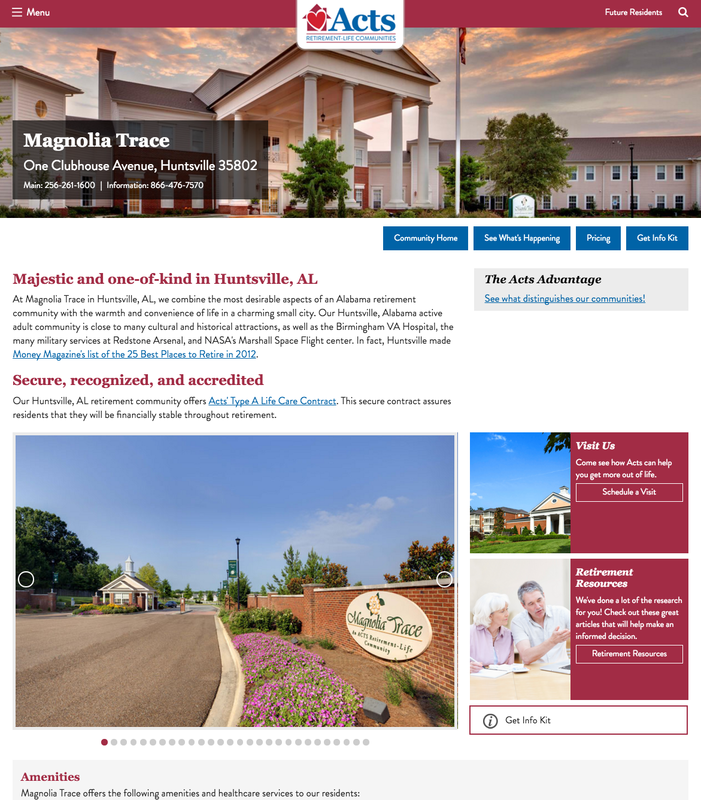 Since Acts is a nationwide leader in retirement living, they wanted to provide their website visitors with helpful resources on retirement living or preparing for retirement living. There are free resources throughout the site, including informative articles, videos, and even downloadable e-books. But the main focus of the site is its community pages. While Acts residents get the extra bonus of being able to enjoy the amenities of any of the 21 communities, someone looking to retire in Pennsylvania won’t necessarily choose Acts because there are also communities in North Carolina. Therefore, each community needed to have its own spotlight to showcase its own benefits. Enter the community section. It’s the perfect way to search for a new retirement residence quickly and hassle-free. .
We were tasked with developing a website that introduced Acts’ new brand and made it as easy as possible to convince visitors that there has never been a better time to become an Acts resident. We’re proud of how it turned out. Please feel free to visit https://www.actsretirement.org and share any feedback with us so we can make the site even better.